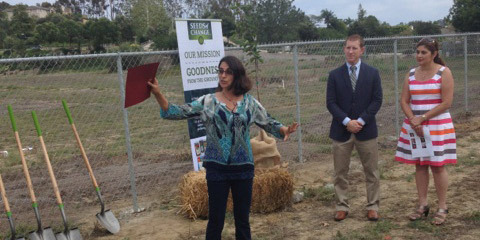 ENCINITAS — It has been a busy three weeks for Mim Michelove, the champion of the Encinitas Union School District’s burgeoning farm lab, and who was recently named the lab’s director. The farming area has expanded. Crops are being picked. The fence line was pushed back to make way for a community “food forest.” An agreement was reached with the Leichtag Foundation to provide farm workers. And on Wednesday afternoon, Michelove and officials from the school district, city and state assembly were on hand as the district received a $10,000 grant from Seeds of Change to help promote the farm lab and the food forest. “It’s been busy, but it’s been a great last month,” Michelove said after the ceremony, which also served as the groundbreaking ceremony for the food forest. Seeds of Change, an organic food brand and a subsidiary of Mars Inc., awards grants to schools and local programs that support sustainable communities and farming. The $10,000 grant is the second highest amount they award: four programs received $20,000 grants and five received a $10,000 grant. Overall, Seeds of Change awarded 34 grants totaling about $200,000. Among the speakers at Wednesday’s event was Deputy Mayor Catherine Blakespear, who has championed urban agriculture as both a candidate and a council member. She spoke enthusiastically about the benefits of the district’s agricultural endeavors, which she said impacts the children in multiple ways. Michelove, who helped to lead the district’s agricultural initiatives since their inception through her nonprofit Healthy Day Partners, said grants like this help the district meet some of the ambitious goals it has for the land, which the district bought over a decade ago and was originally slated for a traditional school before the farm lab concept took shape. Michelove, who will earn $110,000 a year overseeing the district’s agricultural programs and the farm lab, said the summer has given the district the opportunity to accomplish a lot of tasks with the lab. Workers recently added irrigation infrastructure that expands the land available for crop production by four acres. Farm workers harvested and preserved 1,000 pounds of fresh peppers, tomatoes and summer squash that will be used for student meals in the fall. The school district established an agreement to work with the Leichtag Foundation’s nonprofit farm arm, which will provide workers for the 10-acre farm. Plans are in the works for a district-wide retreat at the farm lab, and work has already started on next season’s crops. The district is also working on the plans to transform the bungalows on the grounds into the nutrition, science and maker lab space that it envisioned when it opened earlier this year. But perhaps the most exciting recent accomplishment, Michelove said, was the moving back of the fence line for the food forest, which she envisions being a tree-lined stretch of edible fruit trees that will connect the community to the farm space. “Today was a major milestone,” she said of the groundbreaking.